The last week in June is usually a very good sea-trout week here at Dinnet, as our visiting anglers will put a lot of effort in during the night. Regular sea-trout enthusiast Peter Horsbourgh and team rotated between Dinnet, Deecastle, Waterside and Craigendinnie beats, and Paul Chambers and team fished the remaining three rods on Dinnet & Deecastle. The beats were drawn on the Sunday evening and so the first sea-trout shift began at Midnight. Sitting at 1″ on the Dinnet Gauge conditions were stunning for chasing sea-trout with warm dark evenings and settled weather forecasts ahead. Paul Chambers had an eventful evening in Bruiach on the first shift where he landed two sea-trout and a grilse. Johnny Sykes also had joy in Pol Bar where he landed a very hard fighting large sea-trout of 5lb along with another 2lber. Patrick Booth also got the ball rolling and encountered a nice sea-trout in Logie Pool which he duly landed. 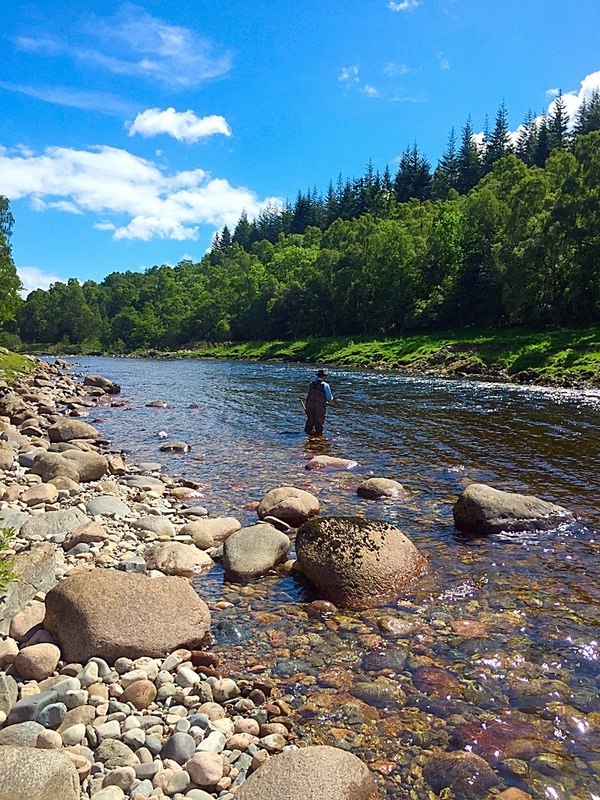 By Wednesday we were up to 12 sea-trout and a grilse on the banks including two 5lb and a 4lb sea-trout. Successful flies were muddlers, small black flies and particularly glow in the dark small tube flies which accounted for a high proportion of this weeks sea-trout. The trick is to carry a UV torch in your jacket and every 5 mins give it a shine on the tube so it glows like a firefly. Things slowed down a little for the latter half of the week and with 6 rods out fishing hard through the night we only landed a couple each night. Rory Skinner had a tough week but made up for it with a cracking 4lb sea-trout on the Saturday night. We finished the week on 21 sea-trout and two grilse.